Last night we sailed from Paros to Santorini. 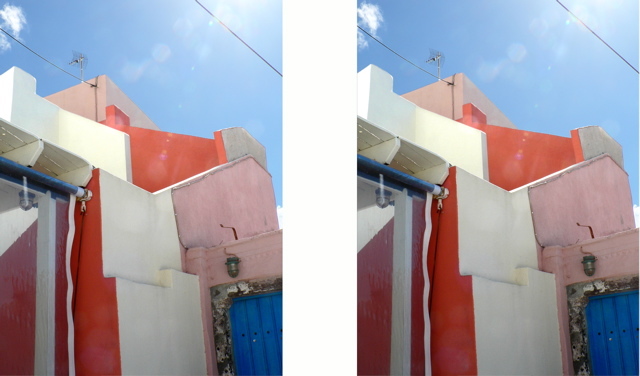 Santorini, or Thera. is the southmost island of the Cyc;lades. the small rocky islands of the Aegean Sea, all of them known for their mountainous landscapes and sparkling blue waters, for their unique folk architecture of cubic and domed forms emphasized by colorful doorframes and window, and, of course, for their history and culture. The island has been known throughout the ages by different names: Strongyli (round in shape), Kallisti (the prettiest of them all), Thera (named after the Spartan king Theras of the 9th c BC), and Santorini. When the Venetians took over the island, they erected a church that was dedicated to Aghia Inni — Saint Irene — Santa Irene — and Santa Irene was abbreviated and became Santorini. Topography: Santorini is undoubtedly a most extraordinary island. It owes its breathtaking beauty to a catastrophic volcanic eruption that occurred in the 17th c BC. Originally, the island, of volcanic origin, was nearly round. when the volcano erupted (either in 1650 or 1630 BC) the major part of the island’s surface submerged, the sea rushed into the abyss, and a great bay was created — the caldera that today measures 10 km by 7 km, while the average depth of the water in the caldera is approximately 1200 m, and is known as the deepest caldera in the world. In addition, what was left of the island was further cut into different parts, creating 3 different islands. The biggest, in crescent form, is Santorini or Thera, Thirasia, and Aspronisi (meaning the white island). As time passed and once again the result of successive late volcanic eruptions and devastating earthquakes, two more islands were born in the center of the caldera: the “Burnt Islands.” They are black lava formations. and uninhabited. The biggest of the two Burnt Islands, the Nea Kameni island, is an active but dormant volcano that has clearly been growing. Judging by the fact that 20% of the island disappeared in the massive eruption, and by the fact that the island was then covered with ash to a depth of 20 meters, it is estimated that the volcanic eruption was 3-4 times as great as Krakatoa, which in 1883 created such a haze world-wide that it lowered temperatures world-wide by as much as 1.2 degrees Celsius, an effect that lasted almost 5 years, and gave the world beautiful red sunsets for many years. The massive eruption of Santorini was dated by examining the effects of ash from the eruption on icebergs in Iceland and bristle cone pines in California. The earthquake of 1750 BC is the probable cause of the Minoan civilization of Crete losing its place as a great trading power, probably due to a large tsunami that devastated Crete. After that time, the Mycenaeans took over as the major trading group. There is a Prehistoric Museum in Fira (the capital town of Santorini) where some of the best preserved finds of Acrotiri, the prehistoric city of the 17th c BC that was destroyed by the giant volcanic eruption, are exhibited. The earliest finds that are preserved date to 6000 BC! Santorini flourished in the Bronze Age, primarily because of its role as a great trade power. The main town before the eruption, Acrotiri, was completely covered with ashes, but apparently most of the inhabitants were able to sail away, taking their valuable possessions. Santorini stayed uninhabited for a long time, Later, it was populated by the Polyponesian Greeks, who named it Thera. The Romans used Thera for exile of early Christians. Princess Irene, for example, was exiled on Thera. When the Italians came, they called it Santa Irini, which became Santorini. In the 17th c AD a new volcanic crater appeared in the sea off the northeastern tip of Colombo (a white island). 50 years later the new island sank again and is now under the sea. notice the long winding path up the cliff from the dock to Oia. We took the finicular (just to the left of the path) up the cliff. Besides the capital city, Fira, there is a picturesque village, Oia, located at the northern most tip of the crescent. It is primarily known for the characteristic cave houses arranged on the steep cliffs of the volcano looking like eagle aeries. It is also known for its magnificent sunsets. Two beaches on the east side of the island, Perissa and Kamari, are covered by black volcanic sand. Oia, Santorini, Greece: doorway The doorways look like they go nowhere. They actually go on the roof, from which there are stairs down to the rest of the house. The soil in Santorini is very soft volcanic, so when people would dig into the rock for housing, the roof was naturally vaulted. In the 1950s there was a big earthquake, and people found that the vaulted roofs of the poor survived better than the flat roofs of the rich. The vaulted roofs also provided some camouflage from marauding pirates. When piracy was a problem, the insides of the homes would be whitewashed for hygienic purposes, but the outside was left un-whitewashed, for camouflage purposes. Now, both the insides and outsides of the homes are whitewashed. In WW II, blue paint (for the Greek flag) came into use to show patriotism. We’re off by bus to the Boutaris winery. The island produces the naturally sweet dessert wine, Vinsanto. There are lots of grape vineyards here. The grape vines are trained into circular wreath baskets next to the ground, and the growing grapes are carefully placed inside the baskets. They can be grown on the ground because the upper levels of the ground are pumice, which lets the water through down to the Botsoalina rock, which is water impermeable, so the grape vines and grapes, on the pumice surface, do not rot. The vines are grown in this manner to save them from the fierce winds that would otherwise tear the vines and grapes to shreds. Picking grapes was originally done by gypsies, but they became too wealthy, so then Albanians were used. Now it is mostly Poles to pick the grapes. There are lots of terrace fields on Santorini, for the growing of vegetables. That evening we had a discussion on current Greek issues aboard the Pan Orama. In 1922 Greece and Turkey were at war, a war that Greece lost. It ended with the exchange of populations, but left some Greeks in Constantinople. In 1954 the Turks expelled those Greeks, but Muslims left in Greece have 2 elected representatives, enjoy all rights of citizens, and have had school texts changed to suit them. Cyprus, which is mostly Greek, was a British protectorate until the 1950s. There was a coup in 1954, so the Turks moved in and conquered the northern part of the island with the excuse that they had to protect the Turkish minority. The capital of Nicosia is cut in two by a wall. They recently cut a small hole in the wall, but it remains standing. There was a referendom on whether the southern part of Cyprus would like a confederation of states (like Switzerland), but the northern Cypriotes said NO. Stella said that it would be a great advantage to Greece to have Turkey admitted into the EU, because Greece is now continuously being threatened by Turkey, but many of the Europeans are against admitting Turkey to the EU because it is so backward, and its people really don’t want to be westernized. Greek society is quite tolerant of homosexuality, but AIDs has changed the behavior of the Greeks, and there is much more abstinence. From 6 to 15, children must attend school. Many go on until they are 18. In the last 3 grades (ages 15-18) you might be “tracked” according to your abilities (more vocational or more literature, arts, and math.) They are not allowed to work until they are 15 years old. All men must serve 18 months in the army. There are entrance exams to go to the university. All the universities are free. Free nursing care is provided for the elderly, which is proving to be a big problem with the increase in the numbers of older Greeks. Greece has subsidized medical care. Patients have a choice of a government hospital or a private hospital. Greeks don’t like or trust President George W. Bush. They don’t understand why he has insisted on this painful war. Macedonia is a former USSR republic. The largest part of its population is Greek, but Macedonia belongs to Bulgaria. Yugoslavian Macedonia was an invention of Tito’s. He created a Macedonian “church”. When Yugoslavia collapsed, Macedonia claimed independence, but they want a flag with the royal emblem of Philip and Alexander, Greek money, and the name of Macedonia for themselves alone. The Greek position is that they could be called Slavic Macedonia, or anything else, but NOT Macedonia. Greek prisons have many of the same problems as US prisons. There are too many people in prison. Besides Greek criminals, Greek prisons are full of Russian Mafia and Albanian thieves. To respond to this problem, Greece is building prisons in Albania and Bulgaria to put their people in prisons back in their own countries. Greece is a poor country, but you don’t see the slum areas or destitution or extreme poverty, probably because the family is such a strong institution in Greece.